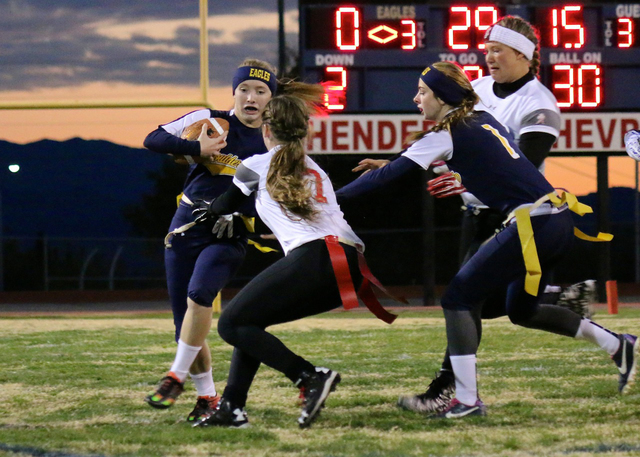 The Boulder City High School flag football program is off to a hot start again this season, defeating four Class 4A teams this past week for a perfect 4-0 record. Laura Hubel/Boulder City Review Boulder City High School's new flag football quarterback, sophomore Taylor Tenney, left, gains some yards as senior Kenadee Bailey, second from right, tries to get between Tenney and the Arbor View players during the Lady Eagles' 25-0 victory on Nov. 30. Defeating Arbor View 25-0 on Nov. 30, Valley 33-0 on Dec. 1, Basic 19-0 on Friday and 4A powerhouse Las Vegas 12-7 on Monday, the Lady Eagles are clicking early on both sides of the ball against tough competition, a positive sign that the reloading process for coach Chris Morelli’s team is going well. The Lady Eagles are staggering opponents with their defense. Senior Kenadee Bailey leads the 3A Sunrise division with 30 tackles, along with an interception that she returned for a touchdown. Senior Emily Mull has four interceptions to lead the league, while junior Daisy Hodgkin has shown herself to be a potent pass-rusher, leading the league with four sacks while adding 12 tackles. The quarterback duo of junior Nicole Valle and sophomore Taylor Tenney have been effective. Leading the league in passing yards and touchdowns, Valle has completed 21 of 41 passes for 339 yards and four touchdowns, while Tenney has completed 11 of 22 for 146 yards and a score. The Lady Eagles feature a more balanced offense this season. Senior running back Alexus Pohe has benefited greatly from the new offensive scheme, tallying a league-high 455 yards and two touchdowns on 51 carries. Bailey also has been effective in the run game, providing 124 yards and two touchdowns on 29 carries while leading the league in receiving with eight catches for 210 yards and three touchdowns. Rounding out the Lady Eagles’ offensive efforts during their four-game stretch, Pohe caught 11 passes for 105 yards and a touchdown, while Mull caught seven passes for 103 yards and Finn caught four passes for 38 yards and a touchdown. Continuing what is one of the state’s toughest schedules, the Lady Eagles will host 4A opponent Liberty today before a Monday home meeting with Green Valley. Over the past four seasons, the Lady Eagles are 67-1, with the lone loss coming to Green Valley during the 2014 postseason.